Weather wise it’s a peach of a Sunday afternoon and along the way to the Hove Place bistro pub, at the top of First Avenue, I ask my accompanying friend Dave whether he’s ever eaten here before, having not myself. Turns out that he has, casually remarking that it was one of the best roasts he’d had in Brighton (and of course Hove). So now I’m intrigued, as too often a pub roast in its bid to deliver the wow factor, can sometimes fail to live up to expectations. Past the front seating area and down the steps inside it’s already busy and we’re only an hour into service. In fact all the interior seating is reserved for diners, so tentatively we walk up to the outdoor area at the rear to try our luck – first come first served outside. At the back you’ll find a swish walled garden; the wealth of plants and flowers make this an appealing space to spend time in. Despite being busy it didn’t feel too over crowded, housing a sensible number of tables and chairs. Presumably this level of business is the norm as they are very well staffed to cope; with everyone visibly working their socks off to provide an efficient service. Slow roasted rolled shoulder of lamb, topside of beef or Wagyu beef, slow roasted pork belly or squash, cheddar and nut wellington all feature but not the trusty though some might say pedestrian chicken, fair enough. We have to try out the beef and at a push opt for the pork over the lamb with a couple of pints of Longman Long Blonde to wet the whiskers. There must be a well drilled kitchen team in force here as plates of food were being produced time after time and looked consistently good. Within about 20 minutes or so our food arrived and presentation wise, which can be tricky where a roast is concerned, they were attractive plates. Too frequently overlooked is the supporting cast of vegetables and thankfully they’re not here just to fill up the plate. There’s an impressive selection; well-seasoned opulent creamed leeks, buttery carrot and swede mash and shredded red cabbage, pleasingly sweet as well as vinegary sharp. My picks though are the unadulterated stem broccoli and baby carrots, simply cooked to just the right point and full of natural flavour. It goes without saying that roast pots and parsnips were present too, fried in dripping – nice touch – and the Yorkshire puddings proved light as a feather. I’m not entirely sure whether we were served the Wagyu or topside of beef; either way there were two seriously thick juicy slabs of beef, served a touch over the medium rare we’d specified upon being asked. Nevertheless the meat was indeed very flavoursome and still pretty tender. The slow roasted pork was the showboat and had certainly accrued the benefits of spending a long time in the oven. The generous barrel of belly served was melt in the mouth soft and utterly delicious. The surrounding crackling, deep crimson in colour, was crisp, salty and lipsmackingly moreish. What a beauty, as was the apple sauce; rich in fruit to match and compliment the pork. 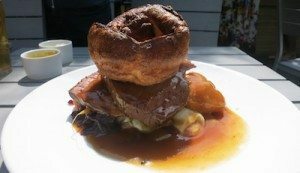 So is it the best roast in Brighton and Hove? I’m not going to tick the commitment box and say yes as I don’t think it’s for me or anyone to say. 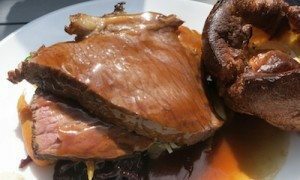 Where roasts are concerned, much like a full English, it’s easy to get hung up on miniscule personal preferences and if you’ve chosen to go out and have a roast it’s a pointless exercise. 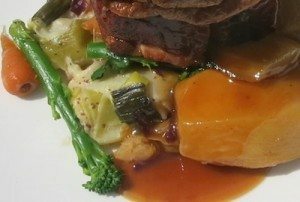 Even having said that, it’s nigh on impossible to find anything but praise with the roasts here; they are exceedingly good and their mid-pricing from £14 to £16 is more than reasonable. 2 courses for £18 or 3 for £22 is a bargain. It’s certainly the best I’ve had in a long while and lots of people must think so too judging by how busy they were, and it wasn’t just roasts too that were exiting the kitchen. So my advice would be to book in advance if you prefer to eat indoors and if you wish to dine outside ensure your time is reasonably flexible, but it’s worth the minor prep. 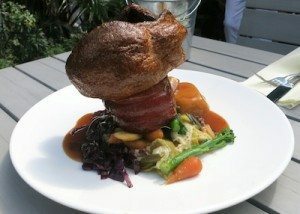 Or pop along later in the day as roasts are served until 10pm, now that’s commitment.